Frank Library empowered our students to create holiday wreaths in makerspaces to donate to our neighborhood nursing home. 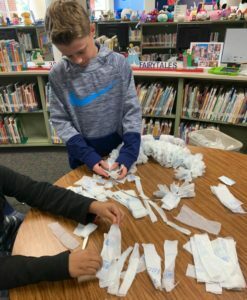 Parents donated plastic bags from Target, HEB, and Walmart which the children cut in strips and tied to a wire wreath. Students worked in groups in the library all week long to create four beautiful wreaths that they were very proud of. Our intention was to spread cheer to our neighborhood nursing home – The Village. 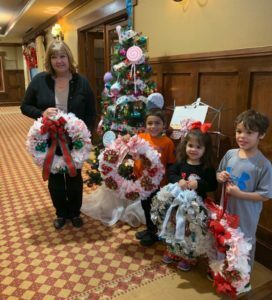 The nursing home was so excited with the wreaths that the children created. They are planning to use one as a donation to their upcoming auction and the proceeds will benefit Tomagwa Ministries. They plan to raffle the other three wreaths to residents in the Village to decorate their rooms. This was a great learning experience that highlighted recycling and taught the spirit of giving which embodies our Culture for Caring in Klein.